In an effort to increase the parking spaces for our vendors in the original vendor parking lot, the Flea Fest Staff has initiated the following policy regarding trailers/box trucks/U-Haul(Rented trucks, etc). We thank you for your cooperation in this matter. 1. No trailers, box trucks or vehicles of any kind should be left in the VIP parking lot areas after load-in is completed on Friday. All vendor trailers and vehicles must be out of the VIP Parking lot by 6 pm on the Friday (the day before the show weekend). 2. 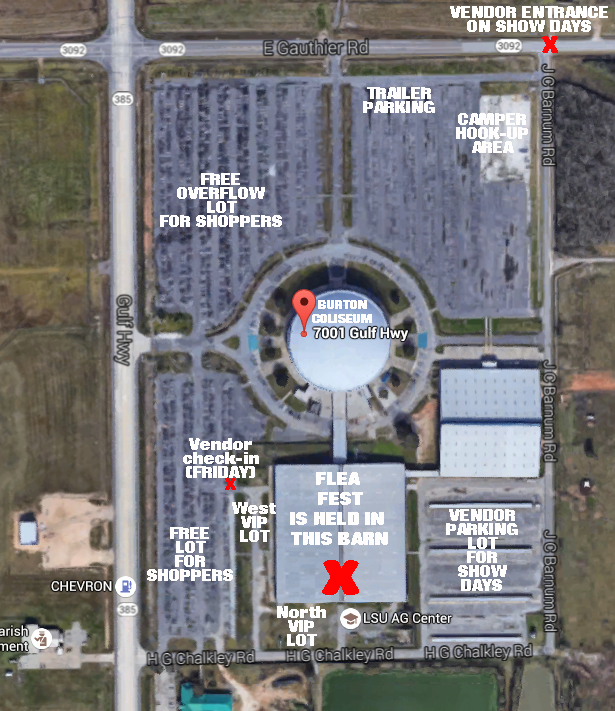 Vendors who would like to leave trailers parked on property during the show are asked to park them in the Burton Coliseum parking lot located in the Northeast corner next to the camper space lot near Gauthier Road. (Use any space in vicinity of this area, taking care to not block or park in any of the camper spots as those are reserved for campers only). 3. Vendors who ABSOLUTELY MUST have access to a trailer, box truck or similar vehicle during show hours, should read the following: There will be a DESIGNATED AND ASSIGNED PARKING AREA for these trailers and box trucks. This designated area is the Southernmost aisle of the regular vendor parking lot. Trailers/box trucks may only be parked in this aisle with an approval and space assignment by a Flea Fest Staff member. This also INCLUDES any trailers that are brought in on SHOW DAYS! Again, trailers ARE NOT permitted to be parked randomly throughout the Vendor Parking lot or in the VIP shopper parking lot. License plate numbers of all trailers, rental trucks and box trucks will be documented as vendors enter at check-in on Friday if a registration form has not been completed prior to entry. Please note: Violators of this policy may be towed at the owner’s expense and may potenitally be banned from future shows. View a sky view property map here to better understand the parking areas.